Bird photography is increasingly an important part of enjoying wild birds. Digital cameras, with a high degree of automation, can help almost anyone take excellent bird photographs. Digiscoping, the use of a digital camera connected to a spotting scope, has also become very popular with many birders. 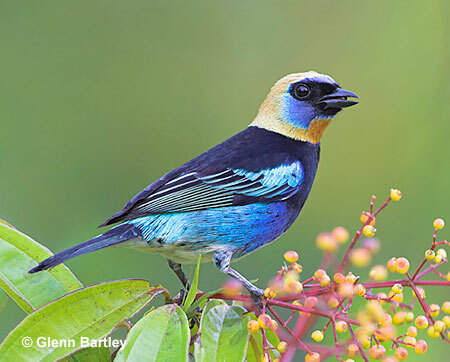 In this section of the site, we'll share information from Glenn Bartley, our staff photographer, and from other bird photographers. We are very pleased to have Glenn Bartley serving as our staff photographer. Glenn really gets around, and we are never quite sure from where he will contact us next. We'll post updates of his trips from time to time. You can also check out his web site for more of his great photographs and products. He also leads photo workshops to places like Peru, Ecuador and Costa Rica. Glenn previously spent several months of intense photographic work in Ecuador. Ecuador is one of the world's richest locations for birds and other wildlife. His trip reports and some fantastic photographs are vailable for you to enjoy. The photograph below is one exmaple of his excellent work. Follow the links on the left to enjoy more of his work. Golden-hooded Tanager, photographed in Costa Rica.